The Fire Magic Echelon Collection goes beyond expectations. The Echelon E1060 is sized at a whopping 48" wide. Like a luxury motorcar, the contoured face of the Echelon Diamond Series, with rounded edges and mirrored highlights, hints at the high performance and exquisite craftsmanship under the hood. Backlit grill knobs feature blue LED bezels, casting a luminous glow against the reflective stainless steel. A flame icon in the knob changes from blue to red as the knob is turned on. The red flame's intensity grows brighter on high and dimmer on low, visually signifying the burner's setting. and lets you know when gas is flowing at a glance. This important safety feature is only found on Fire Magic Diamond Series Grills. 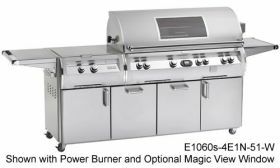 Fire Magic's wood chip smoker features a stainless steel wood chip drawer with its own 3,000 BTU dedicated burner. Add fruit juice, wine, or simply water to your choice of mesquite, oak, cherry or other woods for grilled foods enveloped in a delicate smoky flavor. Halogen lamps shine brightly and are thoughtfully angled for ease of evening grilling. The absence of screws in our design allows for quick cleaning with a damp sponge. Bulbs are easily replaceable. Dual lamps in 660 and 790 models, triple lamps in 1060 model. State of the art electronic thermometer display is loaded with an impressive array of features such as a timer, digital temperature grilling guide, choice of backlit display colors, high temperature limit set and oven light switch. Powered by 110V, batteries are not required. • Most BTUs and heat per square inch - Heats fast, stays hot!